It seemed fitting for our sweet heart table to have the Zelda Piece-of-heart as a centerpiece. To dress it up more, I created a foliage arrangement inside a treasure chest with rupees and jewels. The chest is a ready made chest found at a craft store. 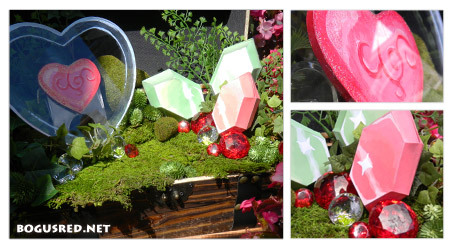 The foliage is made from preserved moss, plastic jewels, fake ferns and ivy, moss rocks, mini pine cone filler. The heart piece is made from plastic custom cut at Tap Plastics and craft foam for the red heart, painted with liquitex acrylic paints and glitter glue. The rupees are paper craft.